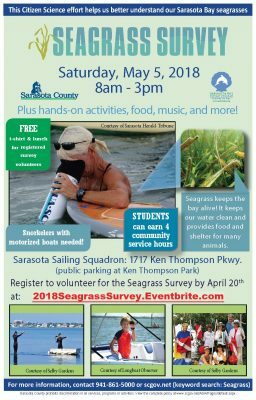 The 4th Annual Sarasota Bay Seagrass Survey and Festival is a free family-friendly celebration of Sarasota Bay. Join Sarasota County and the Sarasota Bay Estuary Program from 11:00am - 2:00pm on Saturday, May 5 at the Sarasota Sailing Squadron (1717 Ken Thompson Parkway, Sarasota FL 34236), just a quick walk from Mote Marine Laboratory on City Island. (Parking available at Ken Thompson Park.) Hands-on activities, nature-themed crafts, educational booths, music, and food vendors will keep family members of all ages entertained! Dip-net for estuary critters with Around the Bend Nature Tours and take a walk on the wild side with Armando Ubeda, Sarasota County IFAS & Florida Sea Grant to learn about mangroves. Make sure to pick up a raffle card and visit at least three booths for your chance to win passes to Mote Marine Laboratory, tickets for kayak eco-tours of Sarasota Bay, a beautiful Clyde Butcher print, snorkel kits, kids' rash guards, and more! Find the event on Facebook & invite your friends!